This is a luxurious, marina style, holiday home offering 5* standards and would suit the most discerning of guests. 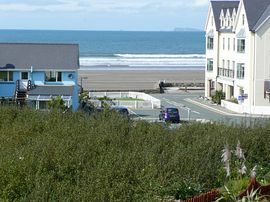 It is located less than 250m from the beach front in the village of Broad Haven in what is one of the most desireable locations in the village. There are 2 bedrooms: 1 king with an en-suite shower room, built in wardrobes and a flat screen TV with satellite channels; and 1 twin with matching bedside cabinets; a wardrobe and dressing table. The modern, fully-fitted kitchen/diner and main lounge are located on the first floor. The kitchen has an integrated fridge-freezer, washer/drier, dishwasher, ceramic hob, micro-wave, oven and grill; and a table with 6 chairs. The lounge is very comfortably furnished with 2 large sofas; a coffee table; side tables and a flat, widescreen TV - again, with satellite channels. There is also a DVD player and CD player. The balcony, accessed by french doors off the lounge, offers spectacular views of the sea and glorious summer sunsets. The garden room, on the ground floor, has 2 two-seater sofas and a TV/Video player. This 2nd. lounge is ideal when accommodating 2 or more generations allowing each to pursue their own interests as, and when, required. This is a child friendly property. Guests have use of a travel cot, portable stair gate, high chair, night lights, a child's table and 2 chairs, children's cutlery and table-ware. There are also games, books, videos and beach toys. We aim to offer guests all the comforts and conveniences of home and have received their endorsement. The price we quote is all inclusive with no extra charges for hot water, light, electricity etc. Complimentary milk and beverages are provided to guests on arrival with all basic cleaning materials also included. Quality of furniture and furnishings. 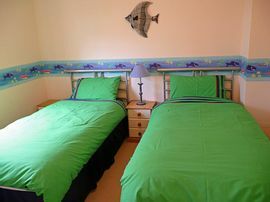 The Ground floor has a twin bedroom, family bathroom and garden lounge with satellite TV. There is a small step to front door and a lip to be gotten over to go through french doors to rear garden. 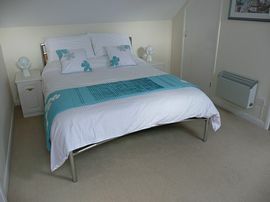 Freshly laundered, quality bed linen is provided together with bath mats, T-towels and oven gloves. Guests are required to bring their own towels. 2 private, off road parking spaces are available at the front of the property. To the rear is an enclosed garden accessed through the garden lounge. This is partially decked with ornamental gravel to the remainder. Garden furniture, including, seat pads, a parasol and sun loungers are available for guests' use. Local Services: Broad Haven is visited by the 'Puffin Shuttle', a coastal bus service which travels around the Pembrokeshire coast offering easy access to many other villages, beaches and also to the cathedral city of St. Davids. At certain times during the summer holidays this service if free of charge! At Carmarthen roundabout, take 2nd. exit over river bridge (A40). Stay on A40 for 28.5 miles until you arrive in Haverfordwest. Take 1st. exit at first roundabout. Take 2nd. exit at next roundabout. Follow signs for B4341 to Broad Haven. Follow the Haven Road (B4341) for 6 miles towards sea front. Take last left turn into Puffin Way (just before promenade). All year - subject to availability. Friday - Friday lets in peak season. Friday - Monday. or Monday - Friday. "Excellent accommodation. Very relaxing few days. Easy access to beach. Will certainly return." The Roden Family, N. Wales. "Beautiful house in lovely area. Highlights include walking along the beach to Little Haven at low tide; baby seals on the beach at Martin's Haven & St. David's Cathedral." The Henleys, Swindon. "Had a wonderful long weekend. The accommodation is fabulous: a real gem in west Wales. Thank you so much." Nigel, Claire & Family, Neath, Glamorgan. 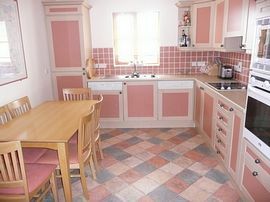 "Superb location and exceptional and tastefully decorated accommodation. We'll definitely be back and will recommend highly to friends." Mr & Mrs Sykes, Amersham. "Wonderful week. Accommodation excellent. Position superb. Garden safe and ideal for the children." Mulroys, Carmarthenshire.